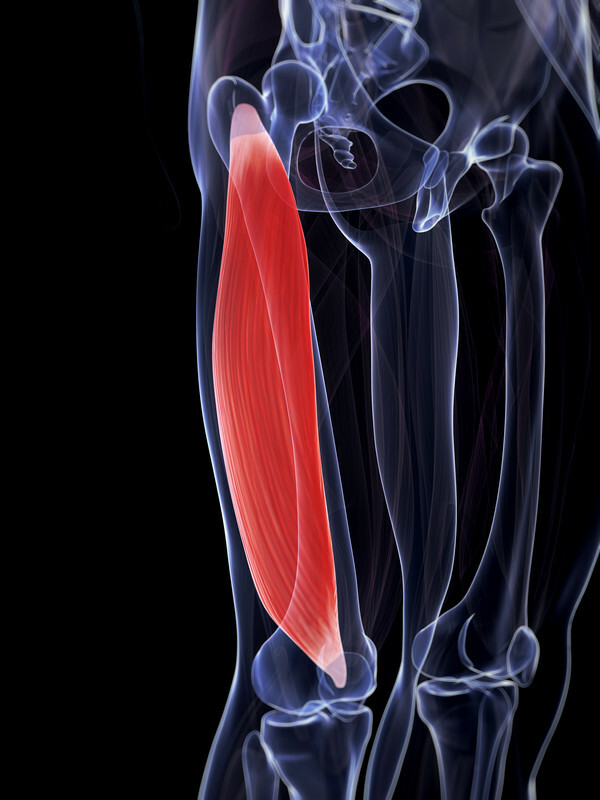 Foam Rolling: IT Band or Vastus Lateralis? Foam rolling to “release” or “lengthen” an overly-taut Iliotibial (IT) Band has been a popular concept in exercise circles for some time, and many people feel that it gives them relief from pain and tightness along the outside of their thigh. It may surprise you to learn, then, that the IT Band by its nature is capable of lengthening very little — if at all. The IT Band is thick, taut, and quite resistant to stretch. In an abstract posted at the Second International Fascia Research Congress in 2009, the authors noted that as seen in recent anatomical studies, the IT Band was “in all cases a lateral thickening of the circumferential fascia lata. It was firmly attached to the femur along the linea aspera from greater trochanter up to and including the LFC” (Falvey et. al.). In other words, the IT Band is an especially thick zone of fascia that naturally envelops some of the muscles of the thigh, and actually attaches to the femur along the lateral-posterior length of the bone. It’s anchored to the top of the pelvis by the Tensor Fascia Lata muscle which, as its name suggests, increases tension along the IT Band with contraction. 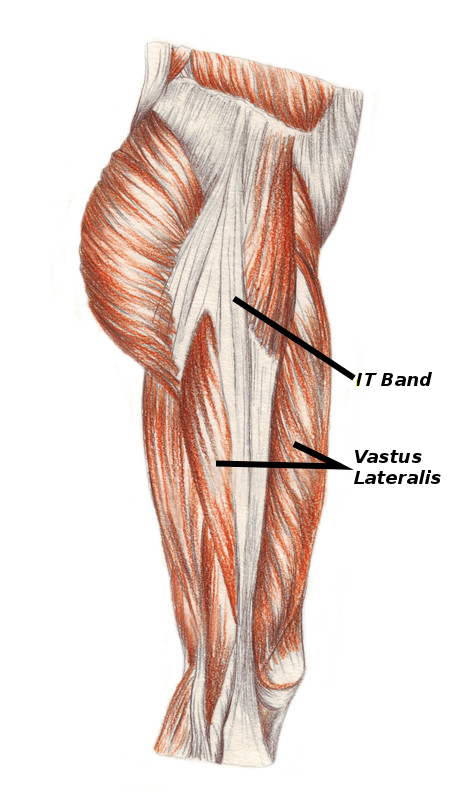 Vastus Lateralis, the most lateral of the four quadriceps muscles, is exceptionally strong and thick. Due to its position and biomechanics, it’s also highly prone to developing trigger points. In The Trigger Point Therapy Workbook, authors Clair and Amber Davies note that “[b]ecause overload of the quadriceps is produced by so many kinds of activity, latent trigger points in the vastus lateralis are present in virtually everyone, though very rarely recognized” (200-201). The gravity-assisted pressure of foam rolling, with vastus lateralis being squeezed between the foam roller and the femur, could conceivably provide enough force to deactivate vastus lateralis trigger points. Since trigger points are known to functionally shorten muscle tissue and inhibit range-of-motion, the release of trigger points in the lateral thigh could be subjectively experienced as “lengthening” or “freeing” sensation. Claire and Amber Davies, The Trigger Point Therapy Workbook. California: New Harbinger Publications, 2004. Eanna Falvey, Ross Clark, Andrew Franklyn-Miller, Adam Bryant, Chris Briggs, and Paul McCrory, “Iliotibial Band Anatomy And Biomechanics, Implications For The Treatment Of Iliotibial Band Syndrome.”Abstract submitted to Second International Fascia Research Congress, 2009. Stewart Wild, LMT CNMT CMTPT, “Pole Dancing on the ITB,” 360NMT Blog, 2013.